The Anvil has been taking a hammering of late, with Redpath, Tweedley, McGhee and myself all bagging some very nice projects. I managed to slap my way up Body Blow 8b+ on my 4th day. 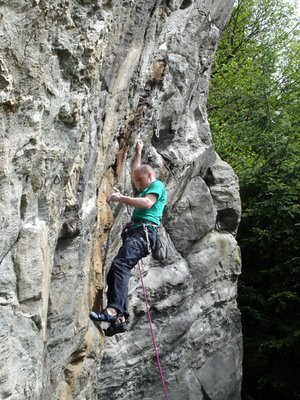 The first 4 moves are cellar style Font 7c+ to a jug, then an awesome 8a+ 45 degree wall to the top. This is the second half of what will be a mega route when my fingers are strong enough to handle double the length of climbing at the same difficulty standard. The full details for this crag are on the Scottish Climbs wiki now. It’s a lovely place, but don’t go there unless you are feeling fit unless you want to be humbled.